on Sunday two weeks ago. We had a fine fish dinner (cod baken à la Dutch cuisine with marsh samphire and friets) at the strandpavilion you can see on the night picture. The lights in the background mark the international shipping route to Rotterdam, Scumsville, Hamburg... Dutch and Belgian pilots are accompanying the ships along the Scheldt river. Philine: I have also a morning pic- but three images are enough. Many thanks, peter! You are right, Chris! Many thanks! I like your evening pictures especially; the light appeals as your dinner...mmmm. The ship's polite do a good and important job. Must be fun in charge of all sorts of different ships. Philine: Polite or pilots or police? Yes, I saw sorts of different ships along the route, esp. big container ships. We visited this strand 'restaurant' three times because of its good, fresh fish 'n' chips (friets). I wish you a good Sunday roast! Many thanks, Alan! A fine set of pictures Philine...your dinner sounded good! Philine: Yes, the fish dinner was really good- we ate three times in this simple restaurant -but even the Dutchies like to eat there, not only the German tourists who are dominating this seaside resort, sadly. This is a 'problem' in many seaside resorts in Netherlands, the Germans are there. And I love to speak rather Dutch than German here! These are very nice shots taken in one place. All very different and all very beautiful. Un très beau triptyque Philine! J'aime beaucoup. A nice trio of shot, Philine. This really does look a nice place to enjoy your evening meal Philine, I know I would enjoy it if I were there. Philine: I'm sure everybody would enjoy this place at the sea. Many thanks, Brian! These are incredible sunsets. 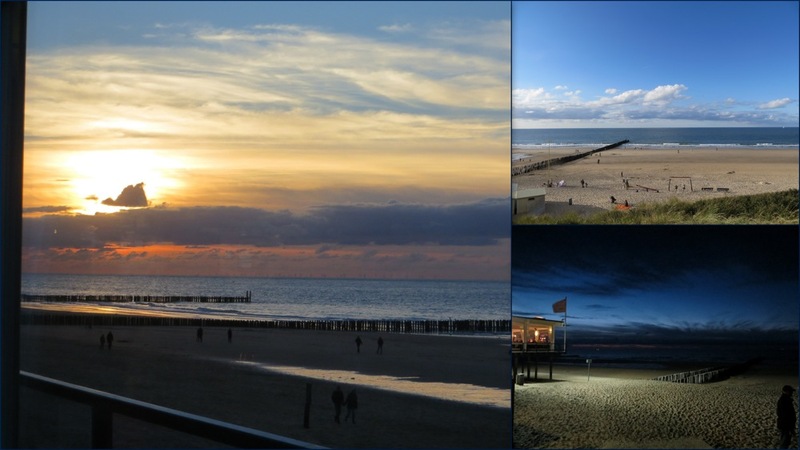 I never was in Domburg, maybe one day we will go visit and walk the beach. Your montages are always beautifully composed, Philine.